Ahhh... my all-too-familiar favourite flyer announcing the next stream of the Foundation Course. 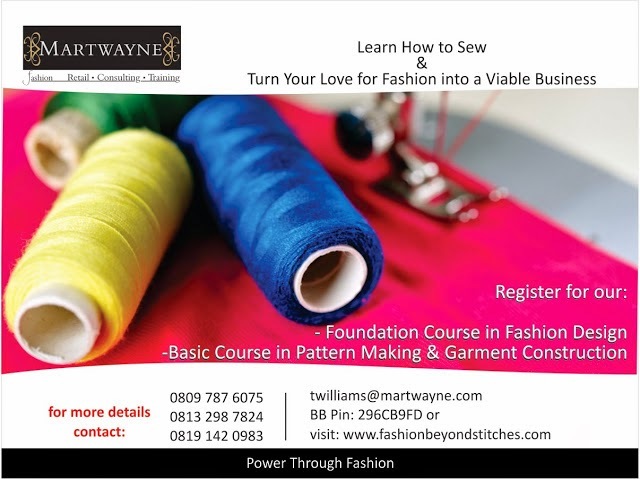 So the next start date for the Foundation Course in Fashion Design is the last Saturday in April, 26th April 2014 for both the weekday and weekend options. This enables us to have a general class for Session 1, which is an interactive session and a Rerun of Volume 1 of the Fashion Entrepreneurship Course. Always the best way to start a new stream. Great! That's all about the Foundation Course. Please share the information without those you know who would love to learn how to sew or sponsor a loved one. Thank you so much. Have an excellent week and a FAB month ahead! I will be away from Friday the 4th of April so my phones may be inactive. If you need to reach me, please send an e-mail to twilliams@martwayne.com or xxaaviere@gmail.com or chat to me via Blackberry on 296CB9FD. You can also leave a comment on the blog. Hi Tope, I would reeeaaaaallllllyyyyy love to start the foundation course cos I luv fashion and I actually make clutches ryt now bt I would luv 2 start designing clothes. The only prob is dat I dnt live in Lagos n I'm abt 2 start my youth service so I dnt knw hw 2 go abt it. Dnt u have oda branches in oda states in Nigeria? BUT... I am working on a project and once it is complete, I will definitely post the details online. Hello! Pls am interested in your fashion courses..what is the training package like?